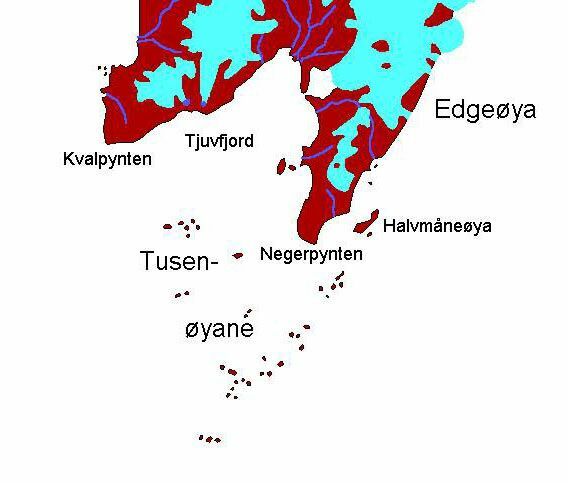 General: The name ‘Tusenøyane’ is descriptive and means ‘Thousand Islands’, which is indeed appropriate. 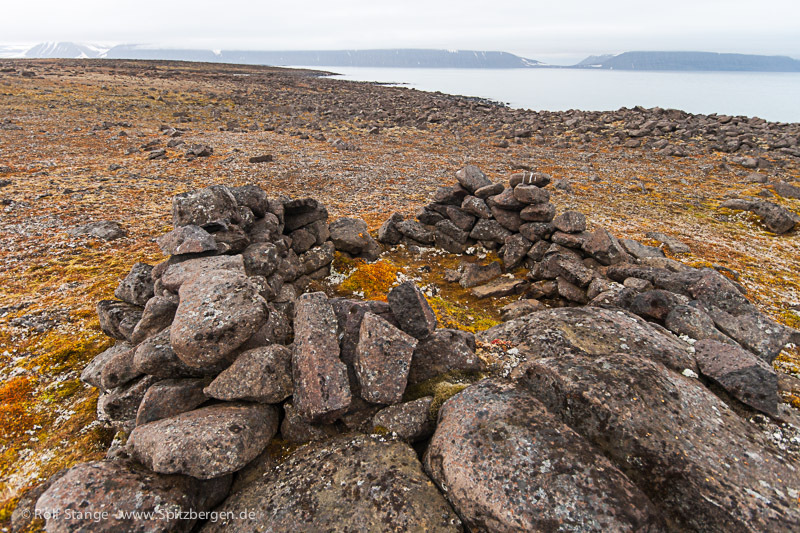 It is a large number of small islands and rocks, none larger than a very few km2. 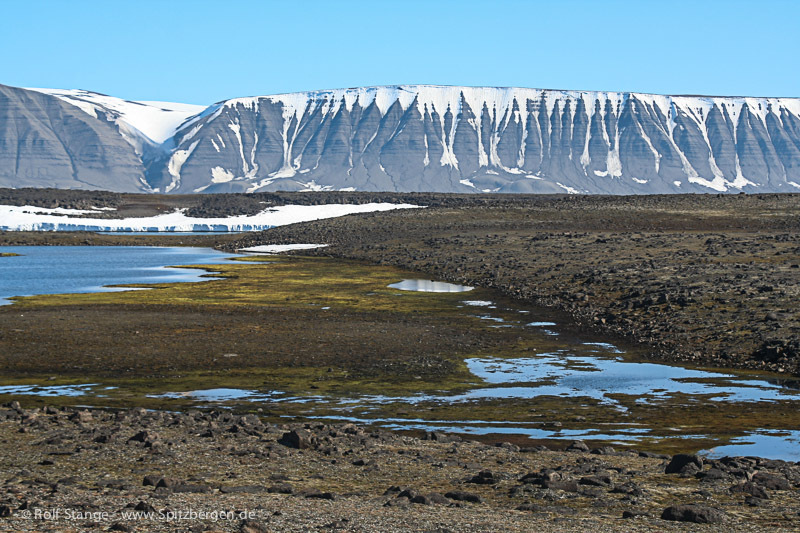 They are quite exposed to the open sea and in shallow, not very well charted waters, so most of them are quite inaccessible. 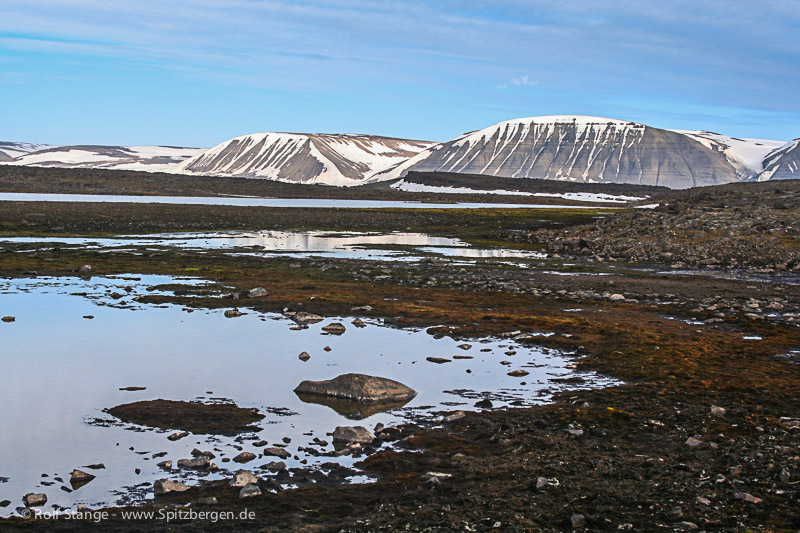 They are part of the Southeast Svalbard Nature Reserve. 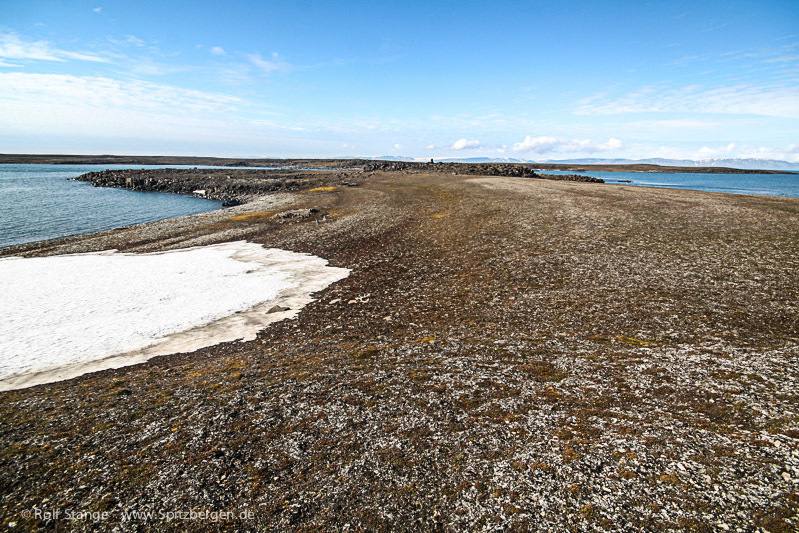 Since 2014, most of Tusenøyane may not be visited anymore from 15th May to 15th August each year to protect birds. 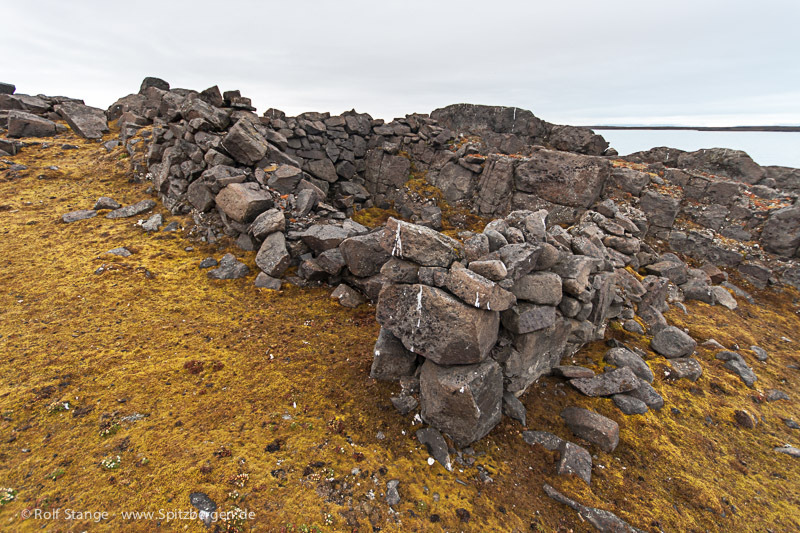 Additionally, some of the island may not be visited anymore at all (Zieglerøya, Delitschøya, most of Halvmåneøya) to protect historical remains. 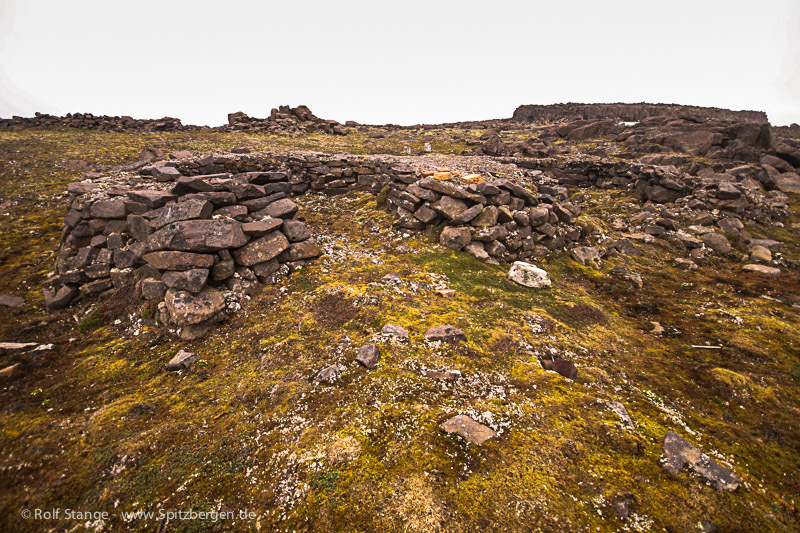 These restrictions are strongly controversial, but they are in force. 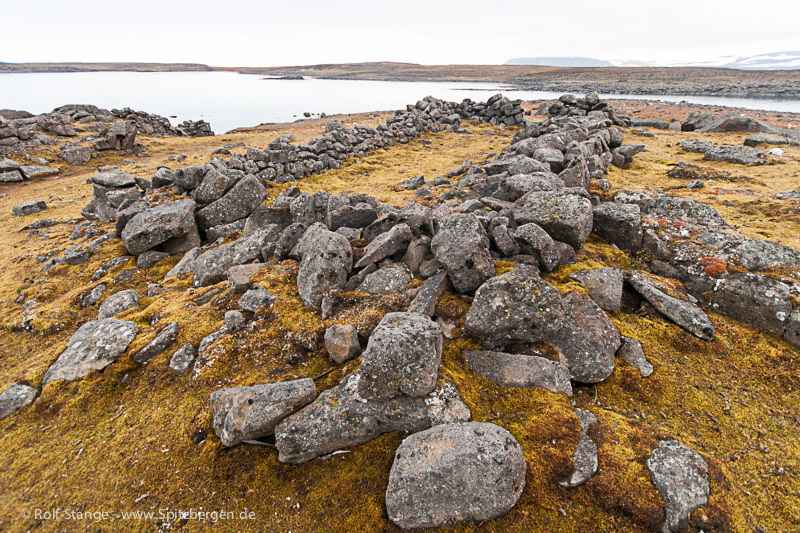 Geology: The Tusenøyane consist entirely of dolerite/diabas rocks (both very similar to basalt), upper Jurassic to Cretaceous in age. 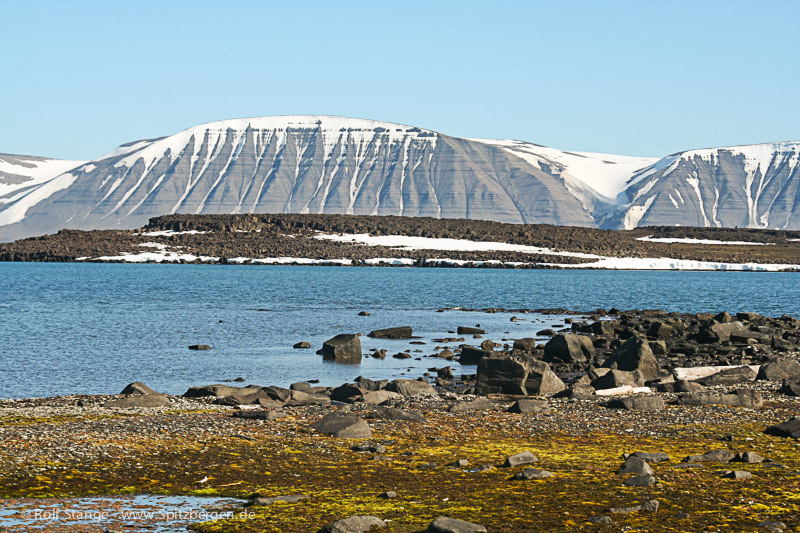 The Triassic sediments, into which the basaltic rocks intruded, have been completely removed by erosion, they still exist further north, where they form the Edgeøya. 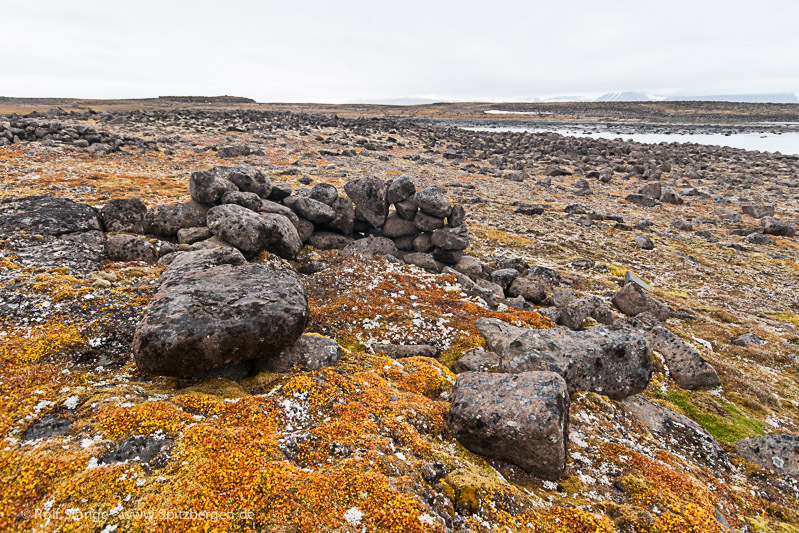 Other rocks can be found only as erratic boulders (‘ice age dirt’). 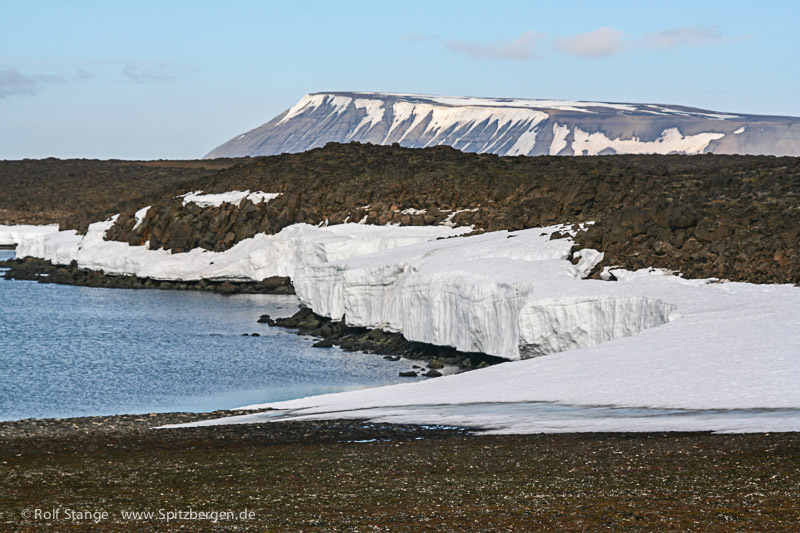 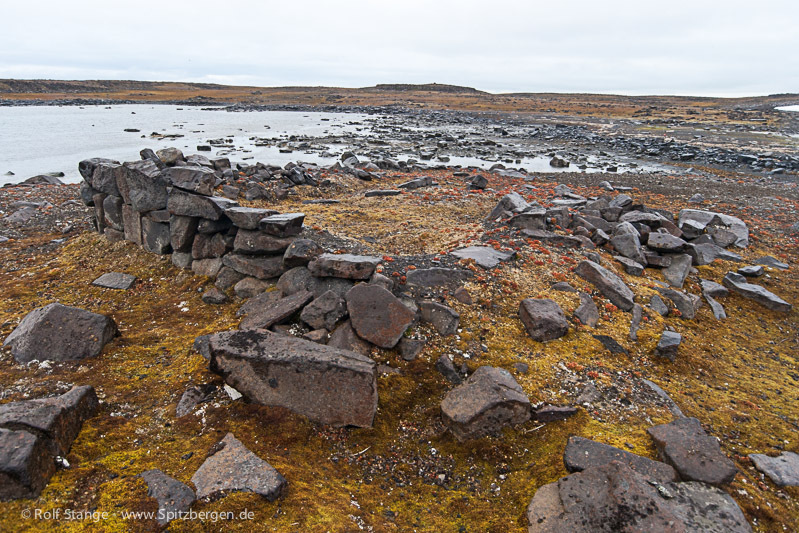 Landscape: Small, rocky islands without glaciers. 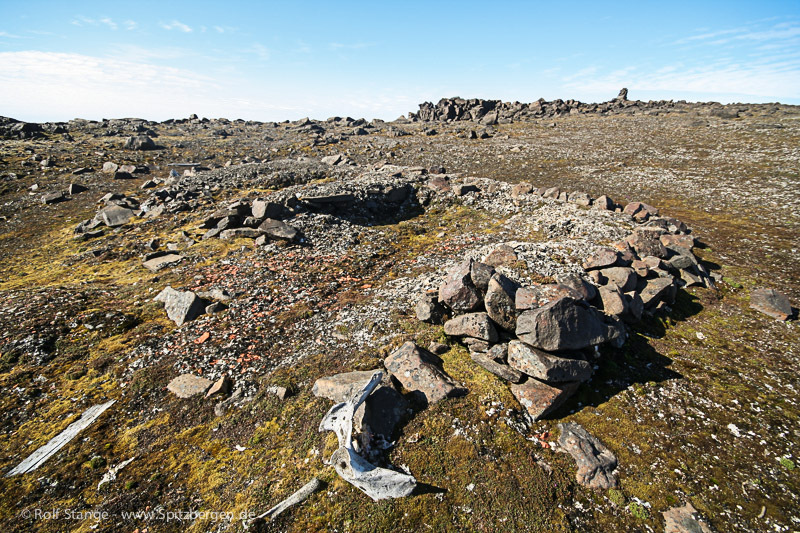 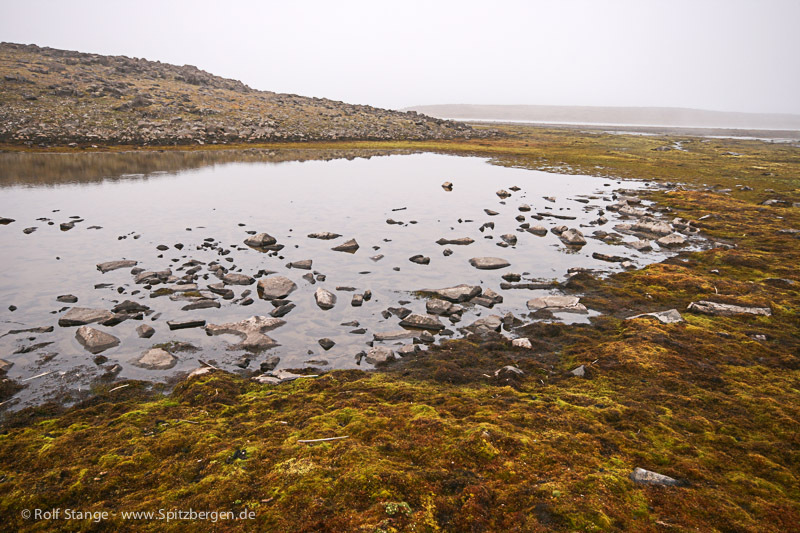 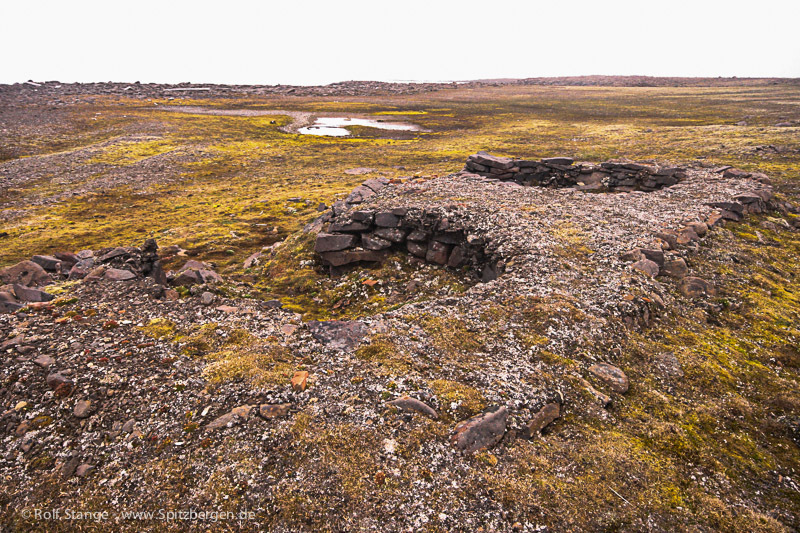 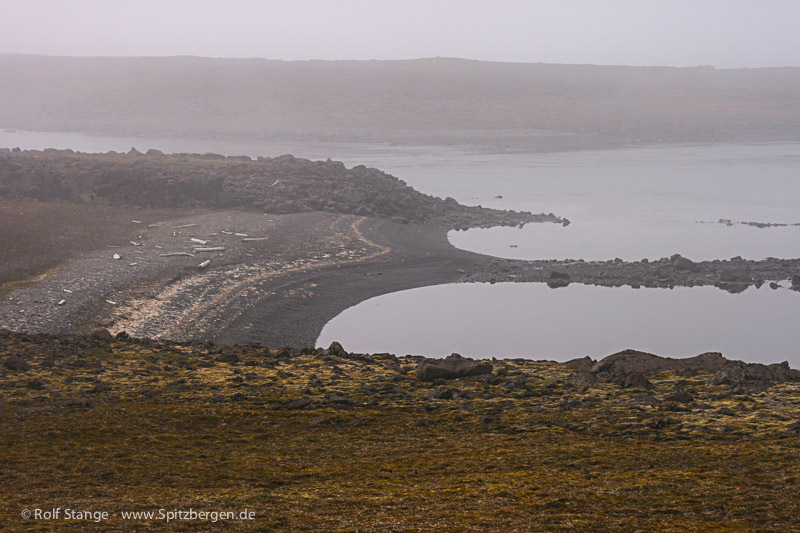 Many of the Tusenøyane are quite barren and covered with large basaltic boulders, other ones have a beautiful, mossy tundra with small tundra lakes. 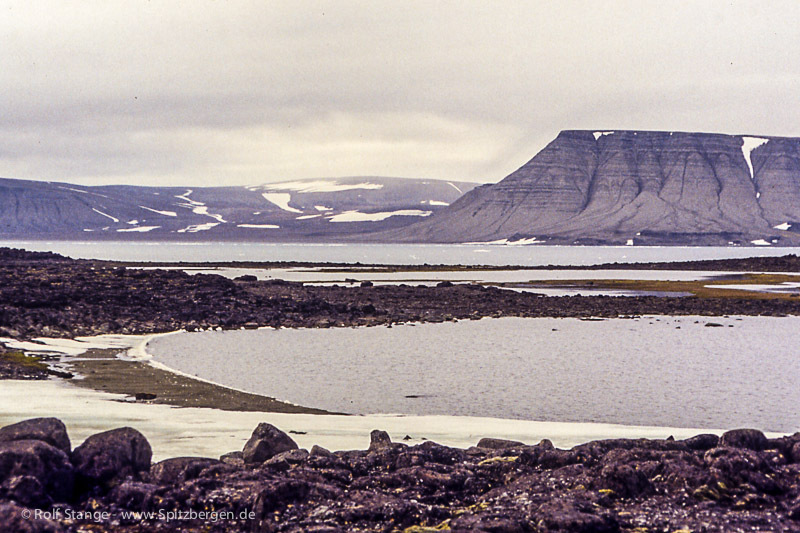 Landscape-wise and geologically, also Halvmåneøya and the Ryke Yse Øyane belong to the Tusenøyane. 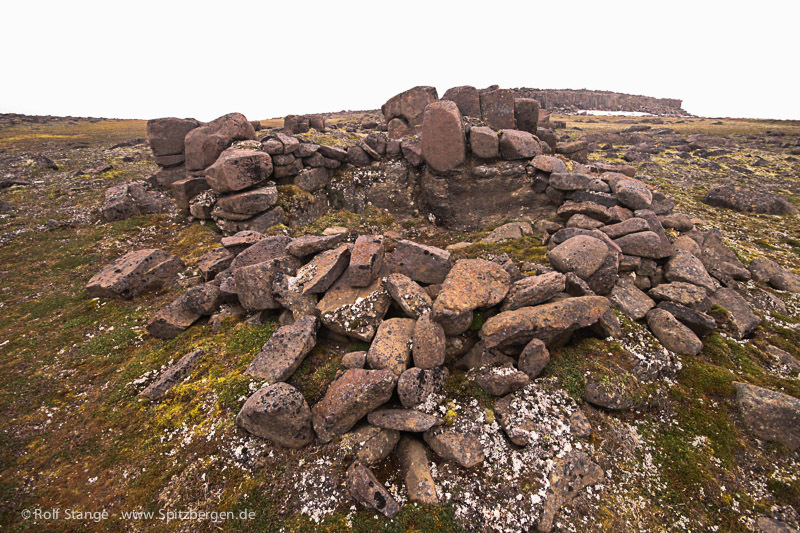 Click here for panorama images of Tusenøyane. 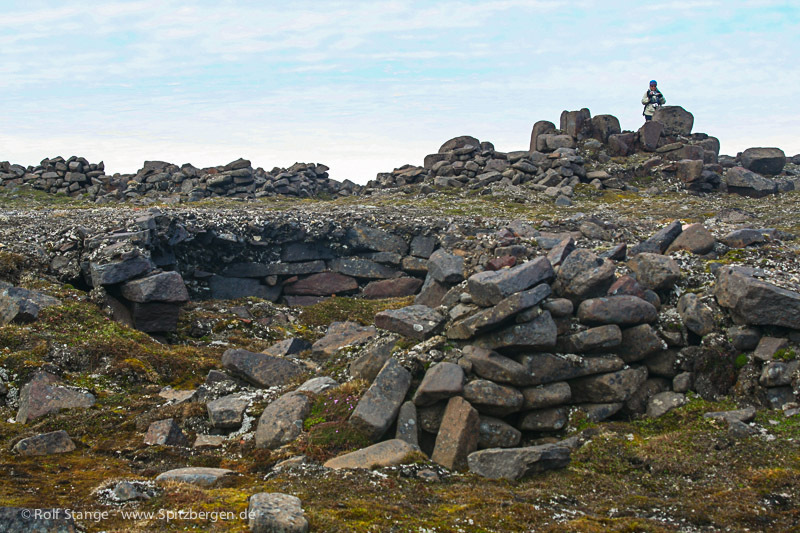 Rocky ‘basalt-landscape’ of Tusenøyane with old hunter’s cabin. 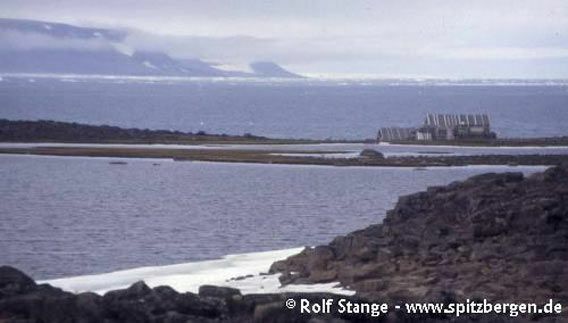 Halvmåneøya. 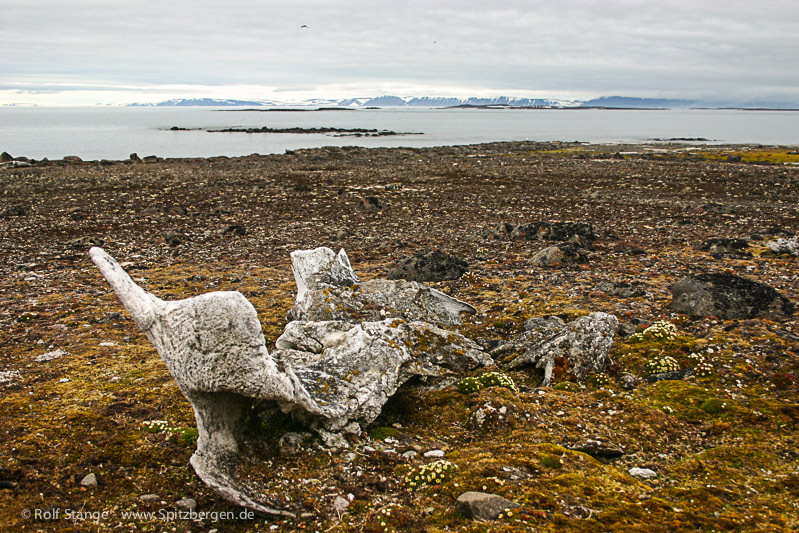 Flora and fauna: High arctic. 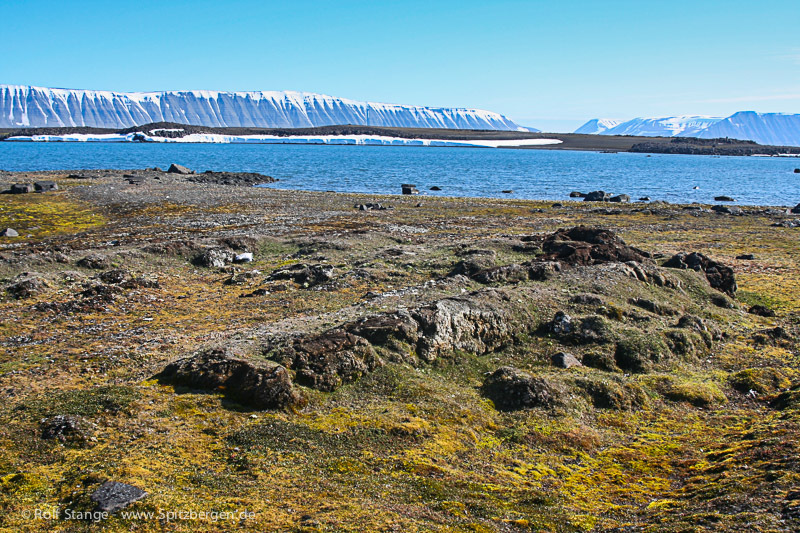 Partly very barren, partly quite rich moss tundra. 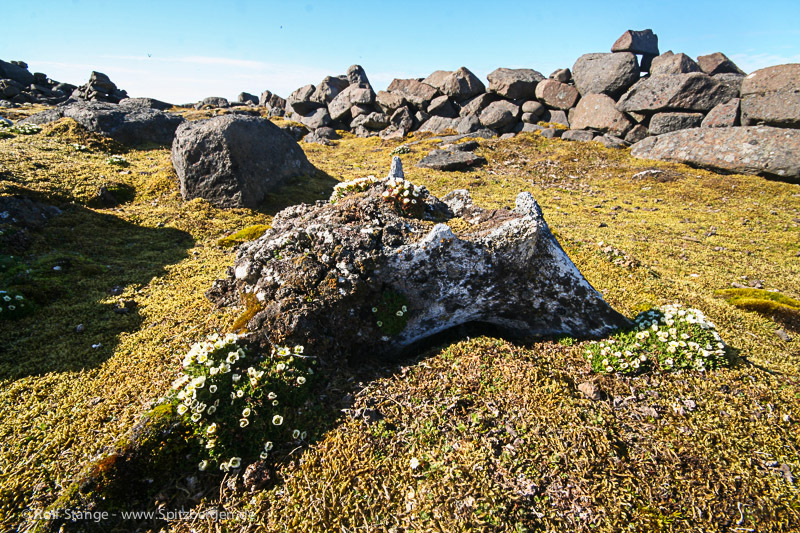 Especially the mosses are quite vulnerable – try to step on stones! 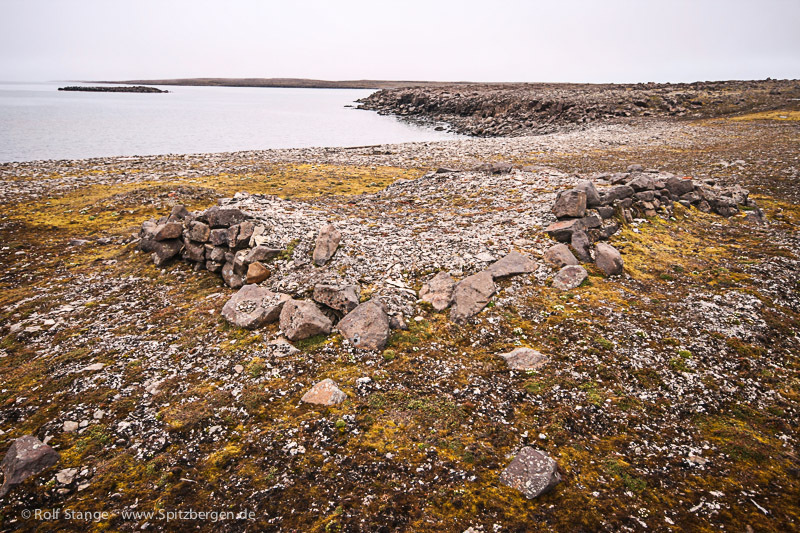 There are small lakes on some of the islands, where often Red-throated divers breed – beautiful birds in a beautiful environment, but easy to disturb at the nest. 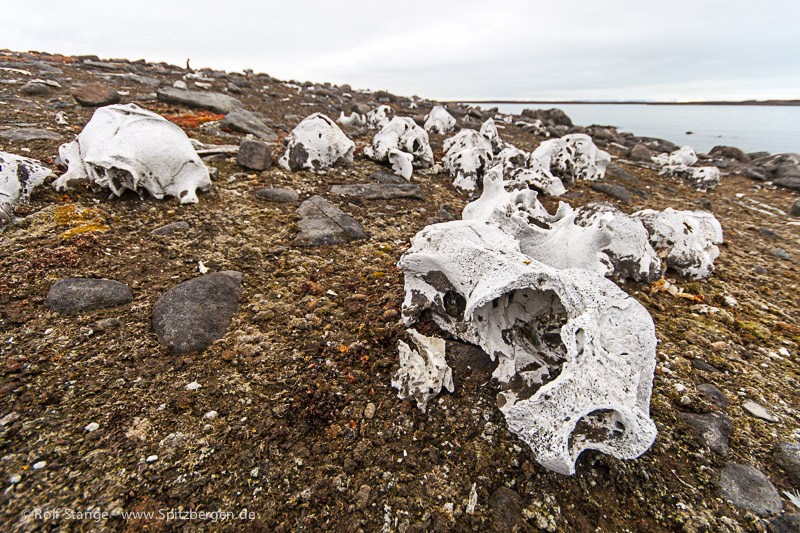 Keep your distance! 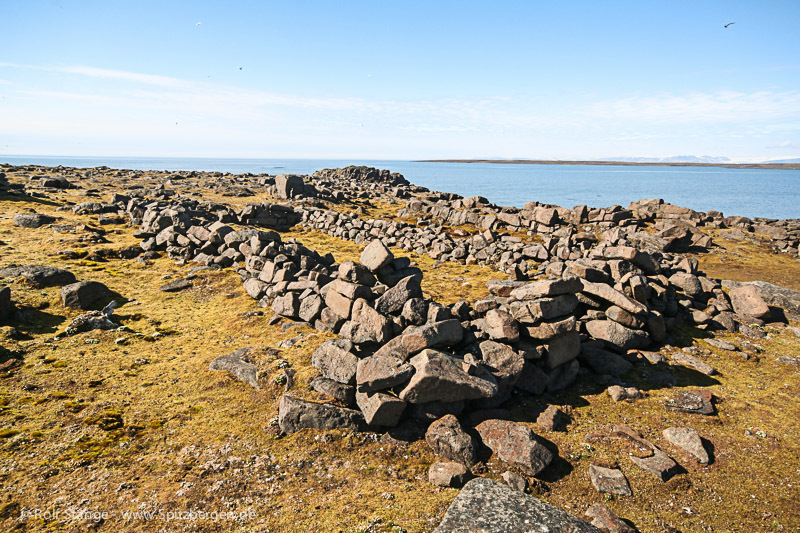 The Tusenøyane are an important place also for Common Eider ducks and geese. 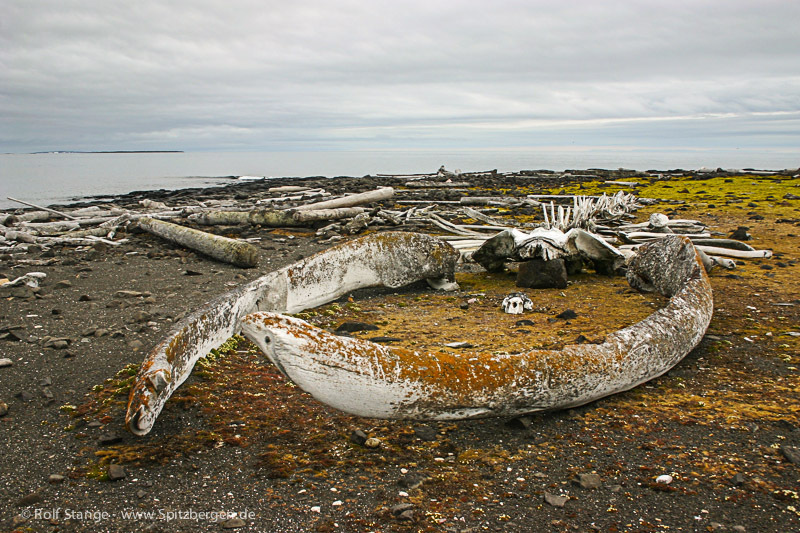 The large areas of shallow water provide good feeding grounds for walrus, which live on shells, which again live in the mud at the bottom. 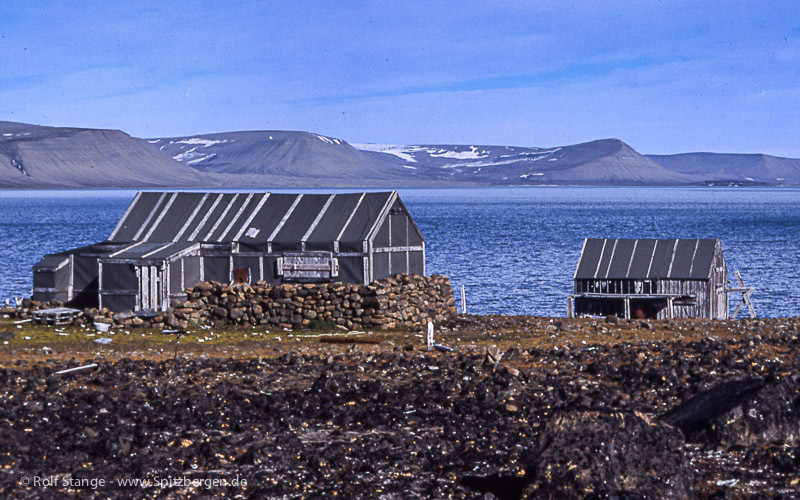 History: Early in the 17th century, the whalers knew the area and established a few shore stations here. 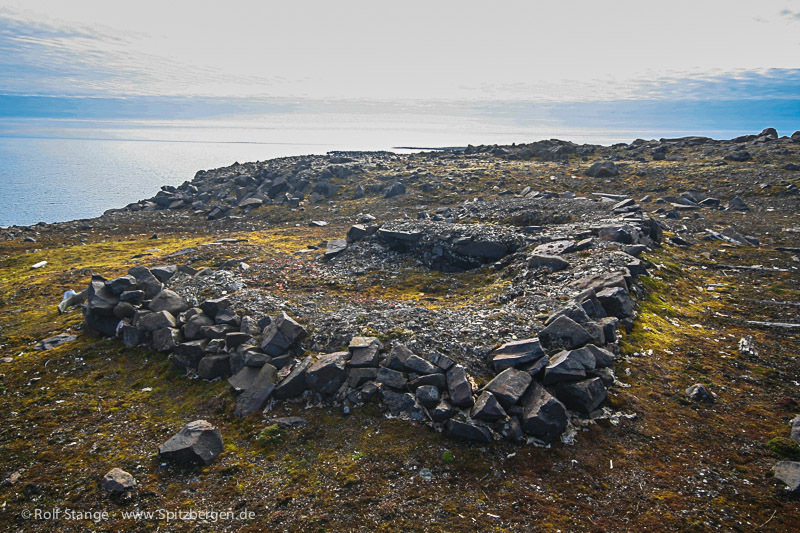 Bluber ovn (double ovn) from the 17th century, Tusenøyane. 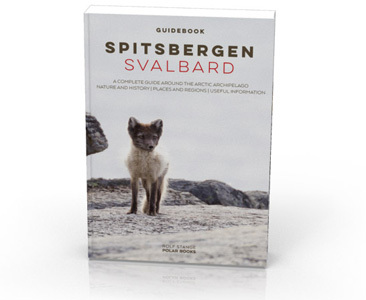 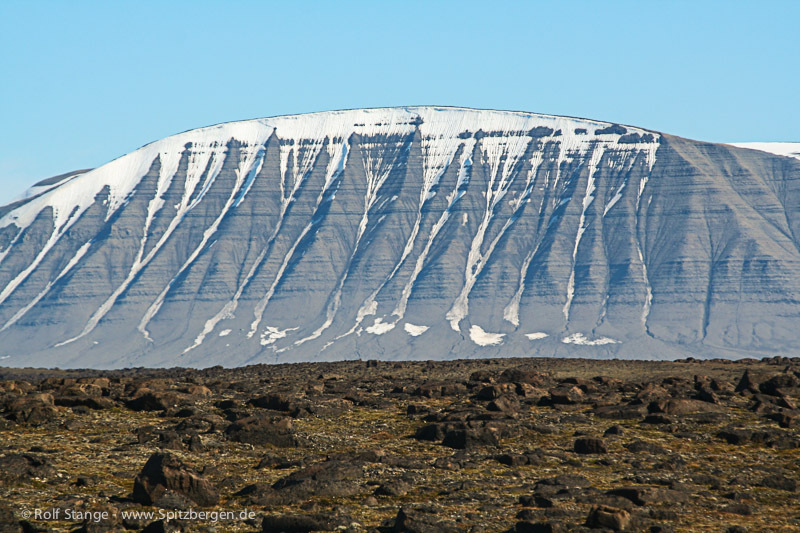 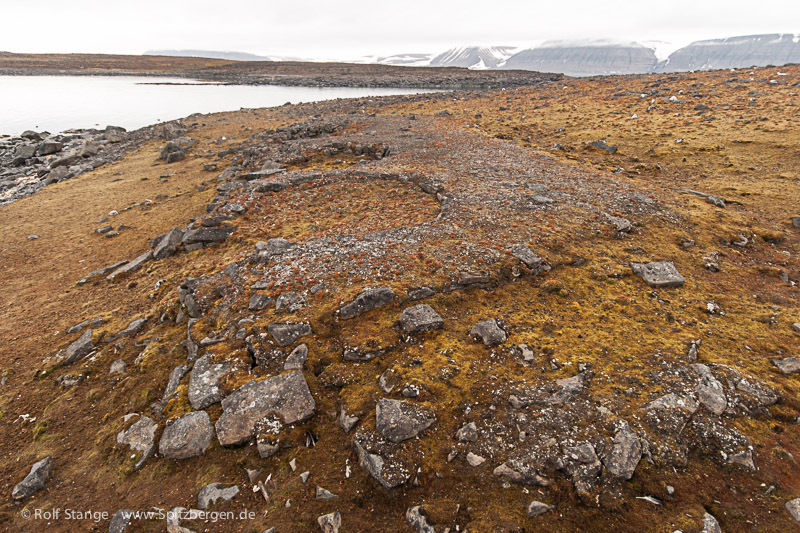 This particular ovn may well be the best preserved one in the whole Svalbard archipelago. 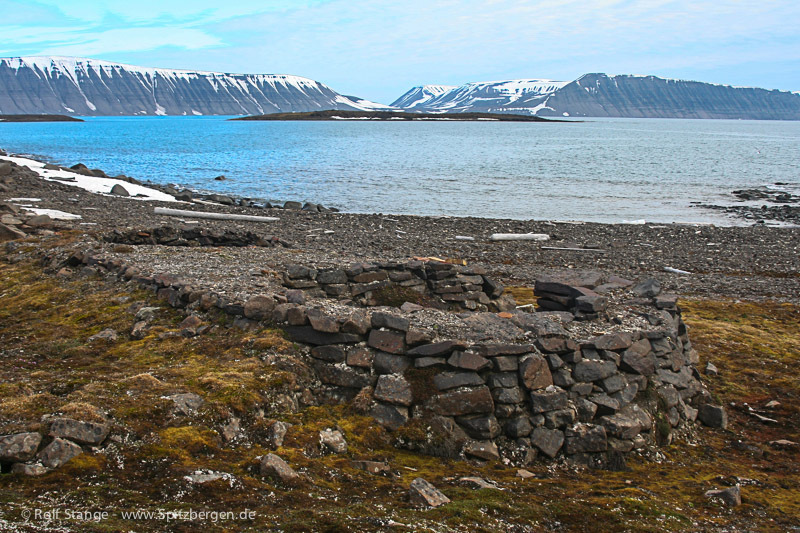 The Tusenøyane were also a favourite hunting area for the Pomors, who may have been there before Willem Barents officially discovered Spitsbergen in 1596. 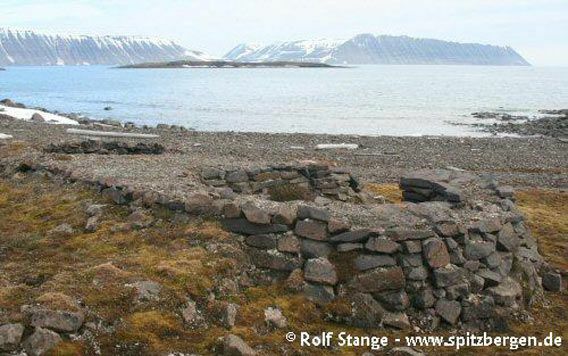 In the early 20th century, Norwegian trappers caught large numbers of polar bears here, especially on Halvmåneøya and in the Tjuvfjord on the southern side of Edgeøya.